I’ve got a fresh new bag class for you! I call it the Hoboken Handbag. It’s now available online with Imagine by Riley Blake. 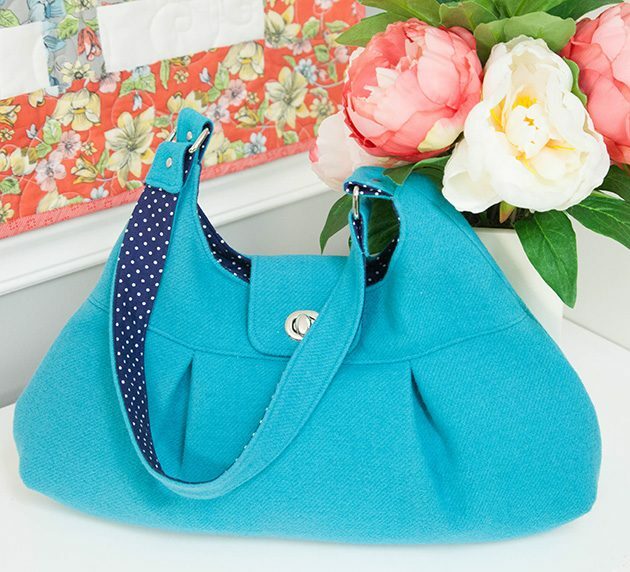 The Hoboken is a mid-size bag, great for date night or meeting a friend for lunch. Just like the Wool Hexie Christmas Stocking Class, this bag is made with bright beautiful wool from Riley Blake Designs. 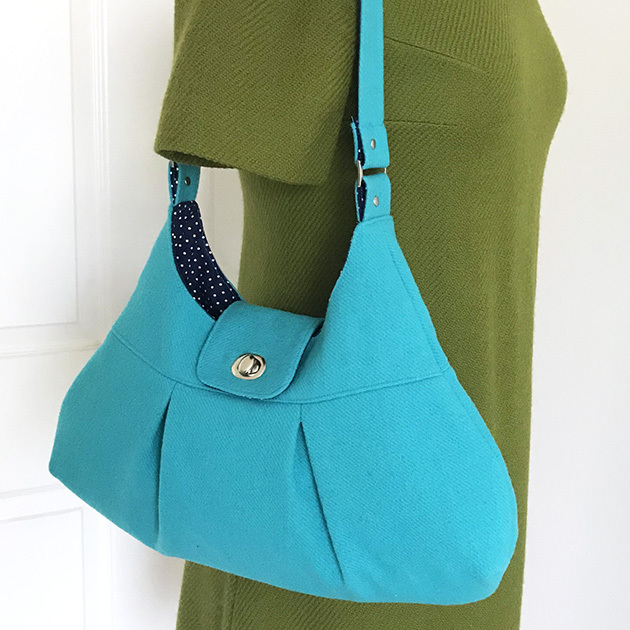 It’s got a cute “hobo” shape with darts, pleats and a shiny twist lock closure. I lined it with a fun little dot fabric for some extra detail. In this class you’ll learn about working with wool, installing hardware, inserting a zippered lining pocket and setting rivets. There’s even a kit option if you need help gathering materials. In case you’re wondering about the name, Hoboken is a town in New Jersey, not far from where my grandparents lived. My grandfather was the chief of police in their town and would take the train home in the evening after a long day of work. Hoboken was his stop and he was often awoken by the conductor yelling, “HO-BO-KEN!” when it was time to get off. Knowing that this got my grandfather moving in a hurry, my grandmother took to yelling “HO-BO-KEN!” whenever she needed him to hustle. So, the bag is partly named the Hoboken Handbag because of it’s hobo style shape and partly because of the funny story of my sweet grandparents. Plus my grandmother was a classy dresser, I think she would’ve loved to carry this bag. 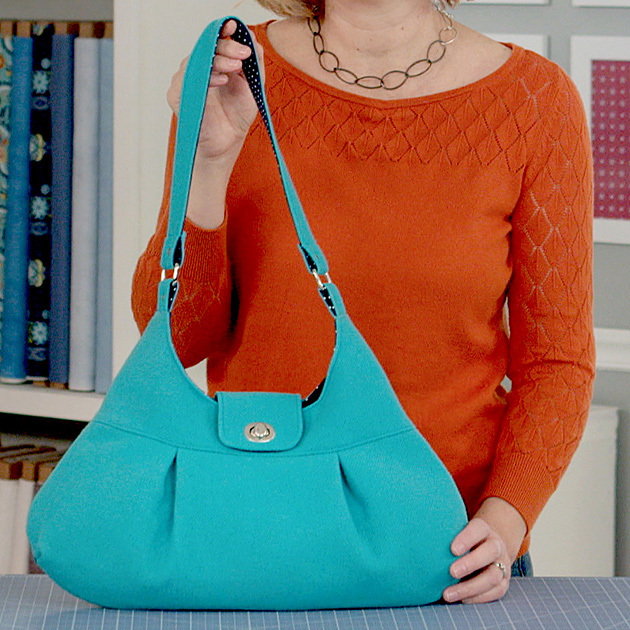 If you’re interested in making this bag, hop on over to Imagine with Riley Blake to watch a short preview video and sign up for the class! It’s a lovely bag in a pretty fabric. I’m already thinking ahead to Christmas 2018!